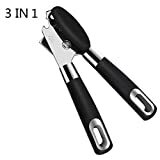 i Click 'view all' to instantly compare this ok deal with offers on other top manual can openers. Bovado USA Can Opener, Rubber Grip Handle Heavy Duty Chrome Steel Black is currently selling at $9.99, which is its normal price. It has a lowest price of $9.99 and is selling within its usual range. Price volatility is 0.15% (meaning it does not change often), so you might have to wait a while for the price to drop. Until then this is a recommended 'ok deal'. The current deal is also the best price on this item over the last month. 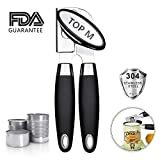 Compare the current price, savings (in dollars & percent) and Buy Ratings for the top Manual Can Openers that are closely related to Bovado USA Can Opener, Rubber Grip Handle Heavy Duty Chrome Steel Black. Here is how Bovado USA Can Opener, Rubber Grip Handle Heavy Duty Chrome Steel Black compares with other leading Manual Can Openers. Bovado's Hand-held Gear Driven Can Opener is a must have kitchen staple that you'll be glad you have on hand in a pinch! This manual can opener features a heavy duty swing design and is made of heavy gauge steel with rubberized handles and crank plus a hardened and sharpened carbon steel cutter that allows for smooth and easy operation. 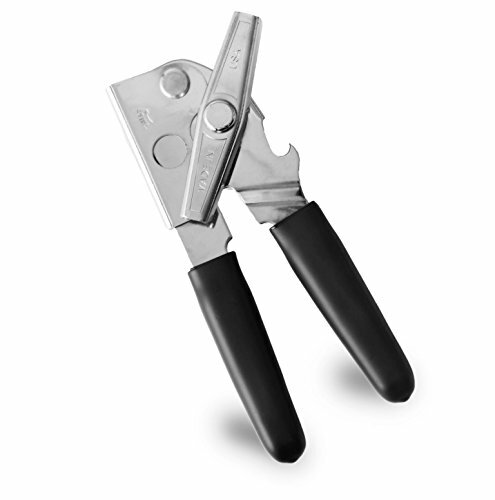 This can openers stellar design is the very definition of quality and is sure to stand the test of time. This handy, easy to use can opener makes a great gift for just about anyone including your favorite cook, host or hostess. It also makes a great housewarming gift. Use it to quickly and efficiently open canned goods and bottles. The rubberized grips provide traction, giving you more control, especially for harder jobs that require some extra elbow grease. This can opener is easy to manipulate, clean and store! With this lightweight can opener you can easily transport it without worrying about having to plug it into a power source and it is easy to clean by hand with warm, soapy water. Because of its compact size it's easy to store out of sight when not in use. Let Bovado's Handheld Can Opener make life in the kitchen a little easier! Bovado takes customer satisfaction seriously and we are committed to making products that we know you will love. If for any reason you aren't satisfied with your purchase contact us so we can be of assistance. FeaturesQUALITY DESIGN: Our manual, gear driven can opener features a heavy duty swing design, made of heavy gauge steel & chrome plated carbon steel handles and cutter for easy operation.LIGHTWEIGHT: Unlike bulky electronic can openers that can be difficult to transport & require a power source, this easy to use, lightweight can opener can be easily & effortlessly maneuvered.RUBBERIZED GRIPS: The easy to handle rubber grips give you more control over this can opener and give traction, especially for more strenuous jobs that require more elbow grease.MAKES A GREAT GIFT: This must have essential item for the kitchen is a great gift for your favorite cook, host or hostess, college student & makes an especially great housewarming gift.